Do you have a dog that is difficult or risky to walk? We can help. With expert knowledge in dog behaviour as well as the legislation as it relates to reactive or aggressive dogs in Scotland, you can be sure that there are no safer hands to leave your dog in. As the owners of reactive dogs ourselves, and having helped many clients to manage and modify reactive and aggressive behaviour, we can appreciate how unique each and every dog and situation is. 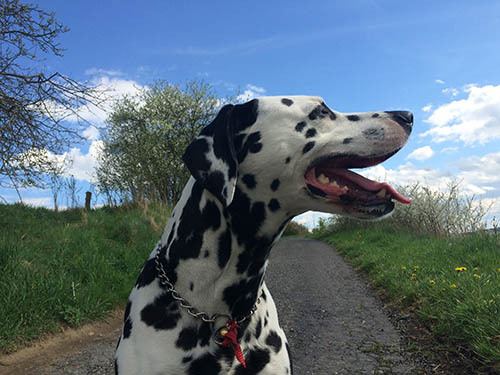 We will ensure your routines, instructions, preference and needs are fulfilled, giving you and your dog peace of mind and an enjoyable walking experience. All dogs are walked as individuals – never as part of a group – and behaviour work can also be taken on as part of the walk: please see below for more information. We want you and your dog to feel comfortable, and so the first step in arranging our service is to book in for an initial behaviour consultation. This will give us a chance to meet, discuss your requirements and head out on a walk together so you can talk us through your specific situation and your dog’s individual needs. There is no obligation to sign up for any more of our services after the initial consultation. For our standard walking service we will aim to keep away from your dog’s triggers entirely and will not undertake any specific training tasks. However, if your dog is on a behaviour plan, we will use the walk to build in behaviour and training tasks that will help your dog gradually overcome their issues. Please get in touch for more information.